It&apos;s understandable that the editorial staff at The Daily Texan is breathing a sigh of relief right now. After quickly apologizing and sacking its cartoonist Stephanie Eisner, the Editorial Board undoubtedly believes it can quickly move on from this episode. That&apos;s a real shame, and the paper should reinstate Eisner. Much of the criticism focused on the use of the word “colored” in the cartoon. Protesters argued that this word was a highly derogatory and antiquated reference to African-Americans, and that using this word belittled Trayvon Martin. But back in 2008 Lindsay Lohan used the term “colored” to describe then President-elect Obama in a television interview with Access Hollywood. Instead of protests and threats of ending Lohan&apos;s career, Lohan got a clean bill of health from the NAACP. Indeed, the nation&apos;s largest African-American civil rights organization noted that the term “colored” is neither derogatory nor offensive. It&apos;s a bit of a double standard to give Lohan a free pass on the use of the word “colored” while excoriating Eisner for doing the same. At any rate, does anyone really think that these protesters would have been mollified by a word other than “colored”? Suppose that the term “black” or “African-American” were inserted in its stead. Would there truly be no outrage? George Carlin once famously stated, “Language is all about context, and words have different meanings.” The cartoon&apos;s critics evidently ignored the words “THE MEDIA” etched on the chair. The woman in the chair, who also personified the national media, read aloud a crude and oversimplified narrative of the tragedy in racialist terminology. Instead of acknowledging the complex and multifaceted nature of the murder, the national media persistently focused on race and race above all else. That&apos;s why Eisner&apos;s statement that the cartoon was an indictment of base racialism should be at least considered at face value. Even a cursory interpretation of the cartoon that sees the cartoon as belittling Martin&apos;s death has flaws. Stripped of adjectives, any statement would ultimately boil down to “a man murdered a boy”. Even if one set aside race in the tragedy for a moment, no journalism, yellow or otherwise, could change the veracity of that statement. How can anyone belittle the gravity of such an awful truth? But I digress. Even if you entirely disagree with me, and hold that Eisner&apos;s cartoon is intrinsically racist to the core, you&apos;d be hard pressed to deny a double standard in her firing. It&apos;s evident that Eisner did not set out to deliberately provoke or offend, but professional editorial cartoonists who do seek to raise tempers don&apos;t get booted from the payroll. 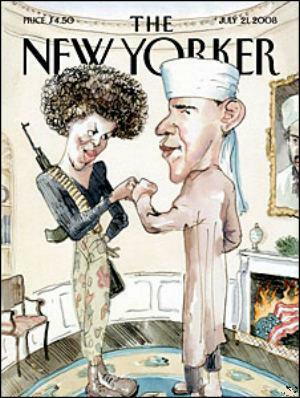 In 2008 the cartoonist Barry Blitt drew a cover for The New Yorker that outraged rank-and-file liberals: The Obamas, dressed in Islamic fundamentalist garb, gave each other a fist bump in the White House as American flag burned in the fireplace. Rahm Emanuel, then a Congressman, angrily declared that he would be canceling his subscription to The New Yorker. Blitt argued that he was satirizing the Right&apos;s obsession with linking Obama to radical Islam, much as Eisner says she satirized the national media&apos;s obsession with race in the Trayvon Martin case. The following year, The New York Post&apos;s cartoonist Sean Delonas caused a firestorm of controversy with a cartoon of a dead chimpanzee and two Connecticut police officers. In the cartoon, one of the cops remarks, “They&apos;ll have to find someone else to write the stimulus bill”. African-American leaders were justifiably outraged at the apparent depiction of President Obama as a primate, and the Post offered an apology to those offended. Both Blitt and Delonas drew controversial cartoons far less implicit in their capability to cause outrage and indignation. In Blitt&apos;s case, the cartoon sought to ruffle feathers. Yet both men kept their jobs and continued to provide illustrations for their respective publications. Eisner, by contrast, was sacked for a far more ambiguous and arguably far less offensive cartoon. This is a fundamental unfairness that The Daily Texan should rectify. Other than the UT Shuttle System and the Nursing School, The Daily Texan is my favorite institution at UT. I used to write for them as an opinion columnist, so I understand what it feels like to be pilloried by the campus community for my views. But freedom of speech includes the freedom to offend, and Eisner did not seek to offend. I have a petition on Change.org calling for her reinstatement, and I urge you to sign it. I think it&apos;s key to separate out the critique of the cartoon provided by the writer here from the larger issue of firing the cartoonist. The critique of the cartoon here reads rather naively, as if the writer doesn&apos;t recognize why so many people found the cartoon offensive. From the misspelling of Trayvon&apos;s name to the rather ham-handed way in which it addresses the topic, the cartoon itself doesn&apos;t have many redeeming factors. Read Ben Sherman&apos;s excellent piece for more on that. The fact is, this did create an outrage, so that&apos;s something the writer here needs to consider more carefully — what was it about this instance that upset people in a manner that was not characteristic of his other examples? How does that outrage connect to the outrage surrounding the crime itself, where a young boy was gunned down for holding Skittles? However, this writer&apos;s post here is itself an argument for what the petition urges — to let people speak their mind, and then have to listen to the responses and potentially learn from them. The writer refers to being “pilloried” for his views. As a Daily Texan columnist, Samian here argued in favor of Photo Voter ID, calling concerns about the voters who would be disenfranchised “overblown.” Arguably the writer himself still has potential for improved sensitivity regarding racial issues, since disenfranchising hundreds of thousands of Hispanic voters isn&apos;t really a great Texan value. While I think Eisner&apos;s cartoon was sloppy commentary at best and inexcusable racism at worse, there&apos;s a part of me that regrets that we won&apos;t be able to watch her future work for signs that she&apos;s learned from this experience and grown a greater appreciation for diversity or at least a recognition of the experiences of others and why incidents like the unjustified shooting of Trayvon Martin prompt such outrage. Thank you, Katherine and Timothy, for your insightful comments. I appreciate it! Give the cartoonist her job back. Don&apos;t get me wrong — I think it was an awful cartoon, and it made me angry. But the whole idea of political cartoons is to put in graphic form what people are thinking, and thrust those ideas forward in a way that mere words can&apos;t.
There are plenty of cartoons every day that make me angry. Michael Ramirez&apos;s hack jobs do that almost every day! Some of my favorite political Ben Sargeant cartoons made conservatives equally mad. That&apos;s the nature of the game. It&apos;s not unbiased fact-telling. It&apos;s opinion. If we get to the point that expressing an unpopular opinion is a firing offense, then we&apos;re in real trouble as a society. The Daily Texan is only demeaning itself by firing Eisner. The right response to speech you don&apos;t like is to exercise your own free speech in saying that you don&apos;t like it. Stephanie Eisner fully deserves the barrage of criticism that she got for her cartoon, and hopefully she is learning from the experience. But she does not deserve to lose her job.